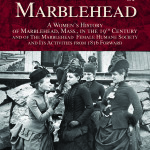 Imagine belonging to the oldest charitable organization in Marblehead. Imagine belonging to one of the oldest charitable organizations in all of Massachusetts. A charitable organization that epitomizes the ideal of helping your neighbor. It’s a tradition of Marbleheaders helping Marbleheaders. Membership is open to men and women. And the Society still maintains membership dues at 10 cents per month or $1.20 per year as first established in 1816. Of course, donations of any amount are always appreciated. The Society invites you to consider becoming part of this remarkable tradition of giving…perhaps becoming a part of history yourself!